Doug Havron smiles as cooks and servers bounce and harmonize to a mix of oldies and Motown blaring from the radio in the squat joint where, in 1981, Reggie Jackson bought humility while loading up on meat-and-three offerings. 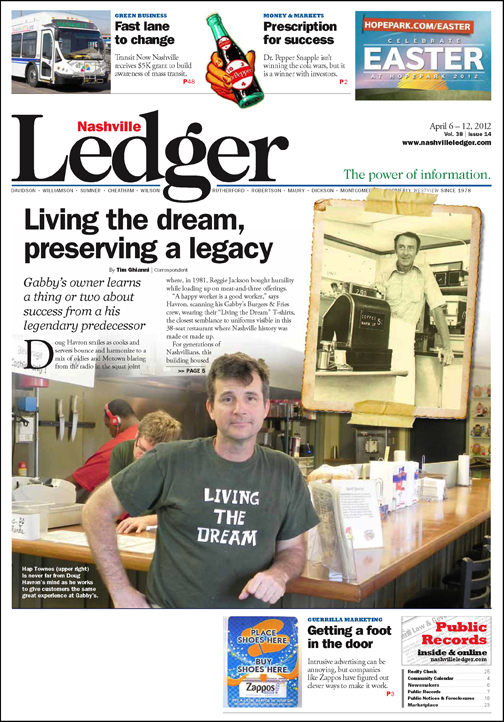 “A happy worker is a good worker,” says Havron, scanning his Gabby’s Burgers & Fries crew, wearing their “Living the Dream” T-shirts, the closest semblance to uniforms visible in this 38-seat restaurant where Nashville history was made or made up. For generations of Nashvillians, this building housed Hap Townes, an oasis of down-home southern cooking. Here James Beverly “Hap” Townes dished up hearty meat-and-three plates for 40 years after he and his dad, the original “Hap” – Garland Townes – opened the place at the end of World War II. Havron is becoming an expert in that history, but he’s making his own, too. For him this cinderblock building is a launching pad for dreams, his own and – judging by T-shirt sales – those of others. Havron was the first one to pull on one of these shirts, with the dream phrase on the front and Gabby’s logo on the back. “I am living the dream right here,” he says, hustling to complete his part of the day’s cleanup quickly so he won’t be late picking up his daughter at school. The ability to do that routine family task is evidence of his personal dream come true. Buying this building was a leap of faith off the fast track, opening the door eventually to an opportunity to abandon the 90-hour work weeks of the corporate restaurant world and live by his family-first rules. He didn’t know then that, in addition to enjoying a more laid-back lifestyle and turning out some of the city’s best burgers and sweet potato fries, he would become proud curator of a legacy that thrived in this building for the decades it housed one of “old Nashville’s” most reliable and happy establishments. He gleams, for example, when he talks about how Reggie Jackson, the biggest baseball star of his era, was treated just like everybody when Hap ran the place. When The New York Yankees’ self-proclaimed “straw that stirs the drink” came here looking for down-home food, that’s just what he got. If he was looking for a place to eat unfettered by his own celebrity, he found that, too. Sure, host Townes gave him a corner table so he wouldn’t be disturbed, but Jackson had to line up for food, just like Mickey Mantle had done during his many visits. Like Chet Atkins did almost daily, as well as other regulars such as Steve Wariner, Whisperin’ Bill Anderson, George Jones, Tammy Wynette, Brenda Lee, Reba McEntire and Les Paul. It was an egalitarian diner eagerly sought out by anyone with stomach set on empty. “Back when the Sounds were the farm team for the New York Yankees, the Yankees were in for an exhibition game. This was back when Reggie was Mr. October,” says Hap historian Havron. Jackson, whose sparring with well-oiled Yankees manager Billy Martin got almost as many headlines as hitting three home runs in a Series-clinching game or “incidental” hip action deflecting a sure-fire double-play, had arrived in town ahead of the rest of the Bronx Bombers and had food on his mind. Farrell Owens, then vice president of operations and part owner of the Sounds, recalls that day clearly. “Reggie says: ‘Farrell, we need to get something really good to eat,’ ” he recalls, adding Jackson had stayed at spring training longer for rehab. He and a trainer were meeting up with his teammates at Greer. After establishing that Jackson was interested in “down-home” cooking, Owens said: “Reggie, we’re going to walk right over here behind the centerfield wall” to Hap Townes. “Needless to say, Reggie turned some heads,” Owens says. “But we got in line like everyone else with those big, old plates. So the superstar slugger got up and asked for more. Townes looked at the best-known baseball player on the planet “and he said ‘That’ll be another meal charge,’” Owens remembers. Townes told the man it was no lookalike, but rather the real deal, in town to play in the ball yard up the street: Let the slugger alone and let him fuel up so he can demonstrate his Adirondack Big Stick batting skills to local baseball fans. “When he’s done eating, Reggie says ‘Man I’m going to hit me a couple of homers today. I could really hit homers if I could eat like this every day,” Owens says. Jackson hit only a deep foul ball in the exhibition, but the story illustrates what is special about Townes. Tracing and celebrating the legacy has been almost a treasure hunt for Havron, who bought the building without realizing its history. It was a neglected real estate bargain on the other side of the tracks from Nashville’s carefully manipulated marketing image. “I didn’t remember it had been Hap Townes,” Havron recalls. “The price was right. The fact it was not in a great location was a perk in my world. You see, that meant it was going to be an inexpensive piece of property. Havron told the electrician it was near Greer Stadium. The electrician didn’t know where that was. Havron gave him some other landmarks. Still the electrician was confused. Three years later, Havron’s become Nashville’s greatest admirer of what Townes created, nurtured and nourished for four decades. Havron lives by that truth whenever a customer steps through the doorway of the business named for his 6-year-old daughter Gabriella. The importance of his family is also illustrated by the fact a person can order a Seamus cheeseburger (named for son Seamus, 4) or have the Coreen, a veggie burger named for Havron’s wife. There’s even a “Tipper Dog,” named for a now-deceased family beagle. “I haven’t named anything after myself, because that seems obnoxious,” he says. Before health problems forced Hap Townes to sell out in ’85 (the business carried his name for a few more years before it was padlocked), this little joint was home to everyone from music stars to a genial-but-corrupt sheriff and his cronies. Havron smiles as he talks about the restaurant he first bought with plans to use as a commissary to supply what he envisioned as a rapidly growing fleet of coffee shops he was planning to franchise. Love of family had him quickly abandoning that caffeine scheme. “The children started coming and the family obligations kept on growing, and I realized with the help of my wife that I was going to miss my children’s lives. I was going to be one of those men that worked all the time and had plenty of money and never spent any time with their children. “It’s great going out and paying cash for a brand-new car. It’s a great sensation. It feels nice. But I wasn’t seeing my children grow up. I would leave while they were still sleeping and got home in time to tuck them in good night. By opening Gabby’s, he could carefully control his own work hours and environment. The loyalty he hopes will flourish here is evident in an anecdote about the former tenant. The couple had come from some northern city; he doesn’t remember which one. “They had decided they were going to have their anniversary meal at Hap Townes. They said the whole last four or five hours in the car, they were talking about the food, all the good things about Hap Townes. Havron, realizing the treasure he owned, decided to solicit more information about the historic business that started in 1921 as a traveling “pie wagon” and eventually migrated to this worn stretch at the end of World War II. “These men would pull me over and tell me stories about how great Mr. Townes was … They would tell me that their first job was washing out trash cans for the restaurant. They all wanted to be in the building again. “People would stop them in the grocery store and say ‘Oh, you work at Hap Townes. What’s the secret of the stewed raisins?’ Anyone who ever visited the restaurant knows that stewed raisins were a Townes delight. “The employees felt like rock stars because they worked at Hap Townes. To be able to create that and to give back to the community, well it is just stunning what he did. The cheery harmonies and laughter of his own staff display that he has recreated that same type of proud teamwork. And perhaps he’ll make enough memories here that one day a couple will come here for their anniversary burgers, sweet potato fries, a Tipper Dog and the new-to-the-menu milkshakes. “I imagine there are very few restaurants where people would drive 12 hours to come and celebrate their wedding anniversary,” Havron says. ”It’s sad that our society doesn’t create things like that anymore. Everything is a chain. Everything is charts and diagrams. He didn’t think that way. People from the 1 percent to the 99 percent, all levels, will tell stories about Mr. Townes. Firemen and policemen also dropped in for quiet pre-dawn breakfast. In fact, he’d like the Chestnut Street railroad bridge – that leads to this building – to be named for Hap Townes. But, for the moment, at least, that’s an unlikely prospect, according to a brief conversation with Billy Lynch, public works director. For now, though, the 46-year-old boss of Gabby’s is serving up burgers to an accompaniment of staff-voiced R&B, nurturing a legacy and hoping, in time, to equal it.